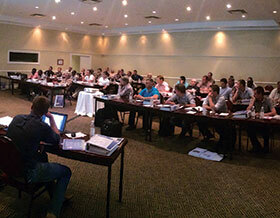 In response to industry interest, Dehn Africa recently ran a two-day seminar to provide attendees with a fully comprehensive approach to lightning protection. The first seminar was run at the end of 2015 in Johannesburg, with further events scheduled for Namibia, Cape Town and Durban in early 2016. The course was endorsed by the South African Institute of Electrical Engineers (SAIEE), which approved two CPD credits for all those who attended. It was aimed at consultants and engineers in the fields of electrical and electronic project design, safety, instrumentation and control, mechanics, construction and civil engineering, along with architects, quantity surveyors and IT specialists. • The characteristics of lightning, how it is formed and the types of flashes that exist; along with the types of risks and damage associated with a lightning strike. building/plant and to apply mitigation methods in order to protect personnel, the structure and its equipment. • Designing a compliant and effective lightning protection system (LPS) including all the elements of an LPS (air-termination systems, down-conductors, earth-termination system, separation distance and equipotential bonding). • Selecting compliant lightning and surge protection devices through understanding the full requirements of these devices and other applicable standards; along with the certification of an LPS using the SANS installation safety report. Aside from the theoretical information, the 50 delegates were also given access to real scenarios, which they could discuss and apply the knowledge gained from the training.